Drawing together two critical moments in the history of European Jewry-its entrance as a participant in the Enlightenment project of religious and political reform and its involvement in the traumatic upheavals brought on by the Great War-this book offers a reappraisal of the intersection of culture, politics, theology, and philosophy in the modern world through the lens of two of the most important thinkers of their day, Moses Mendelssohn and Franz Rosenzweig. Their vision of the place of the Jewish people not only within German society but also within the unfolding history of humankind as a whole challenged the reigning cultural assumptions of the day and opened new ways of thinking about reason, language, politics, and the sources of ethical obligation. 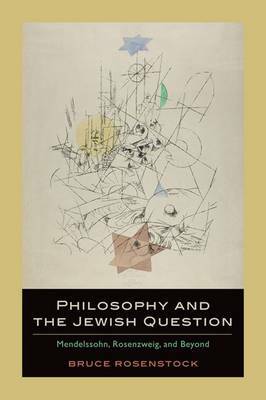 In making the "Jewish question" serve as a way of reflecting upon the "human question" of how we can live together in acknowledgment of our finitude, our otherness, and our shared hope for a more just future, Mendelssohn and Rosenzweig modeled a way of doing philosophy as an engaged intervention in the most pressing existential issues confronting us all. In the final chapters of the book, the path beyond Mendelssohn and Rosenzweig is traced out in the work of Hannah Arendt and Stanley Cavell. In light of Arendt's and Cavell's reflections about the foundations of democratic sociality, Rosenstock offers a portrait of an "immigrant Rosenzweig" joined in conversation with his American "cousins." contextualize Mendelssohn's late 18th-century Enlightenment thought and Rosenzweig's early 20th-century philosophy as critical moments of a theoretical trajectory that highlights the larger philosophical agenda their thought advances." Arendt, and Stanley Cavell. A fascinating and informative read."